OVERLAND PARK, Kan. – Bushnell, an industry leader in high-quality optics that are waterproof, fog-proof and shock proof, announced a complete re-engineering of the company’s popular Trophy line of hunting optics. In addition, Bushnell is now offering a new feature-laden Trophy Xtreme line of binoculars, riflescopes, spotting scopes and laser rangefinders for hunting, outdoor and birding enthusiasts. Bushnell Trophy optics have been trusted for years, and the addition of the all-new Trophy Xtreme line provides even more performance for serious hunters and sport enthusiasts. Both lines will carry the Bushnell “No Questions Asked” Lifetime Warranty. Regardless of how these optics are broken, Bushnell has one response: “Yes, that’s covered.” The No Questions Asked Lifetime Warranty, launched in early 2016, applies to all riflescopes, binoculars and spotting scopes in the Trophy and Trophy Xtreme product families. Both versions of binoculars offer fully multi-coated lenses in an armored chassis. The optics are waterproof, fogproof and built to take a beating while delivering best-in-class durability and clarity. Trophy Xtreme versions offer improved three-step eyecups to provide better fit and comfort, along with larger objective lenses and higher magnification. The new Trophy riflescopes come in seven configurations and six reticle options for edge-to-edge clarity and best-in-class 91% light transmission. Bushnell’s exclusive Rainguard HD waterproofing and fogproof lenses put these scopes ahead of the competition. 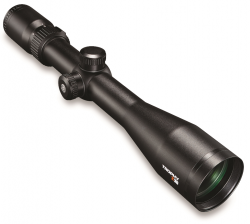 The Trophy Xtreme scopes feature 30mm tubes and 4x magnification ratios. They offer increased brightness and clearer images. Illuminated and long-range versions are also available. The new TrophyXtreme spotting scopes are offered in 50mm or 60mm objective lenses, have up to 60x magnification and utilize a porro-prism design. Users will enjoy the compact tripod, window mount, waterproof hard-sided case and soft-sided case included with this spotter. All models boast 100 percent waterproof rubber armor construction. Difficulty ranging dark, non-reflective targets in low-light conditions is now a thing of the past, thanks to the new Full Spectrum Targeting technology found in both Trophy and Trophy Xtreme laser rangefinders. The 4x20mm Trophy laser rangefinder is rainproof, accurate to 1-yard and can reach out to a maximum distance of 850 yds. Opt for the Trophy Xtreme laser rangefinder and receive the added benefit of Angle Range Compensation (ARC) technology. ARC accounts for the steepness of the shot angle, giving shooters a true horizontal distance to the target for precise shot placement. Bushnell, a Vista Outdoor, Inc. brand, is one of the most recognizable and trusted names in precision hunting, tactical and recreational optics and accessories. For more information, visit www.bushnell.com.